A very, very short history of the cartoon, along with the illustrative magazines, La Charivari (France), Punch (England) and Puck (US). I began my research on political cartoons because I thought it would interesting during these current times. How to start? Who were the artists? What was the art form like from the beginning to now? What I found was a whole basket full of fascinating history. Join me now as I share with you some of what I learned. "I believe that if you can laugh at your rulers, you don't cut off their heads," he says. "Laughter is an escape for those kinds of pent up feelings. It helps make society calmer." Well, said. Sometimes we may want to throw tomatoes at a politician but it's far better, and less messier, if we just enjoy the political cartoons in print and online. It does seem to help. But In the beginning cartoons weren't the cartoons of today. Instead they were studies in sketch form for a more serious piece. Typically, in the Middle Ages, many cartoons were drawn for frescoes. Drawn on sturdy paper, the drawing would have pinpricks along the drawn line. When done, the paper would be hung up on the wall and a pounce used with soot to create an outline through the holes. The method is somewhat similar to some artists using a carbon-like paper to trace their artwork (of their work) onto a canvas. During the Reformation, the printing press and lithography were the new and profound technologies of the day, akin to our current smart phones. Martin Luther capitalized on this by visually soliciting the illiterate public with illustrated posters and pamphlets. He got his message across by using visual propaganda. 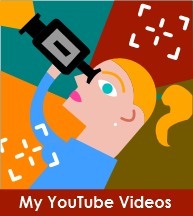 Eventually this type of communication morphed into the caricature and humor to get the message across. 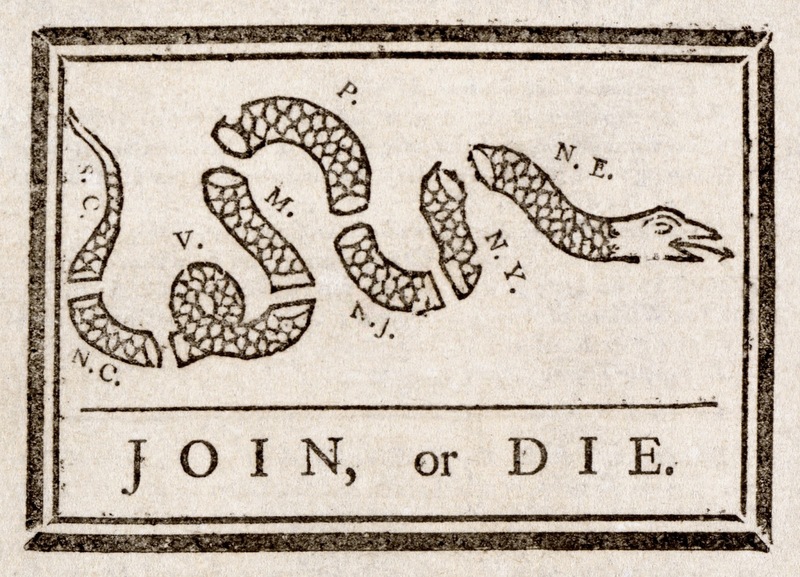 Interestingly, the father of the political cartoon (although he did not use the caricature form) was William Hogarth, a contemporary of Ben Franklin who is considered the father of the American political cartoon. 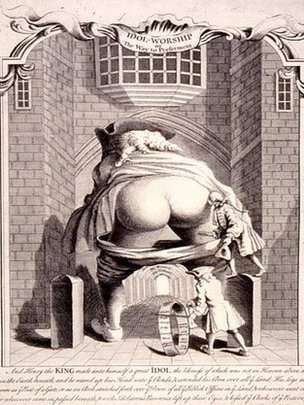 To begin, let’s discuss Hogarth (1697-1764). The first thing you learn about him is that he was considered a pictorial satirist, social critic, and editorial cartoonist. He didn’t really believe that caricature would tell the story effectively so he stuck with his amazing draftsman’s skills and described the event with absolute meticulousness. 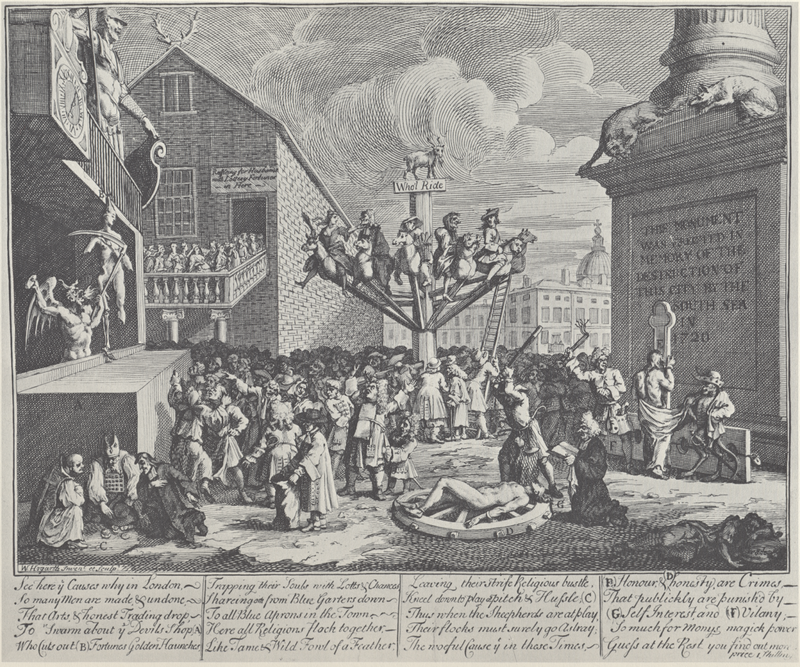 For instance, take South Seas Scheme, an editorial drawing on what became of society because this scheme was attributed to the stock market crash of 1720 (yes, it was happening in those days too). Check out the link above to understand the complicated visuals you are seeing in this picture—from the architecture to the Catholics, Protestants and Jews gambling in the lower left hand corner. It’s an amazing piece of art. 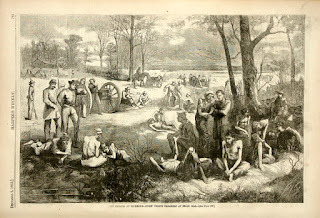 Eventually used to unite colonies against British rule. While Hogarth was making a name for himself in England, so was Ben Franklin—the father of everything it seems sometimes. Both men were in correspondence and some say that Franklin met Hogarth on one of his visits to England. Rumor does say that Hogarth died after he read a friendly letter from Franklin. So why is this so intriguing? 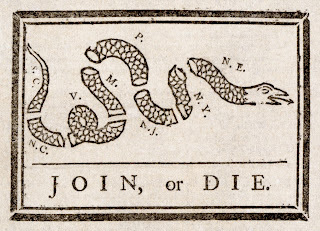 Because in 1754, Franklin drew and published the now famous: Join, or die. cartoon. Was Hogarth an influence? Obviously, Franklin doesn't even come close to the artistic ability of Hogarth, but could have seen the potential in using "visual aids" to support an idea. According to the Cartoon Museum London, the golden age of these types of cartoons was from 1770 to 1830. The genre evolved, using more caricature and humor to get the point across. England was the hotspot with printers holding exhibitions and even selling the pieces for the absorbent price of two shillings. Of course, as you can well expect there was a lot of fodder to be used for the American Revolution on both sides of the pond. The most explicit, I believe, was published by Ben Franklin called The Colonies Reduced, in 1767. 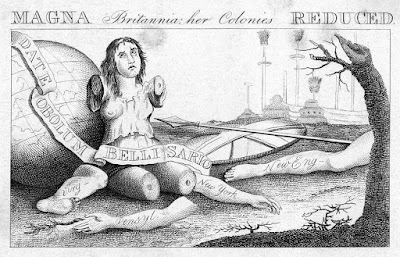 The woman is Britain and her severed parts are the colonies. This was a visual that Franklin used to epitomize his belief that the Stamp Tax of 1765 (one that was imposed without the colonists' consent) would eventually separate us from our motherland. Things started to heat up during the French Revolution in the latter part of the 18th century and artists rose to the occasion. Although England claimed neutrality regarding the revolution, cartoonists were not bound by having their own opinion. 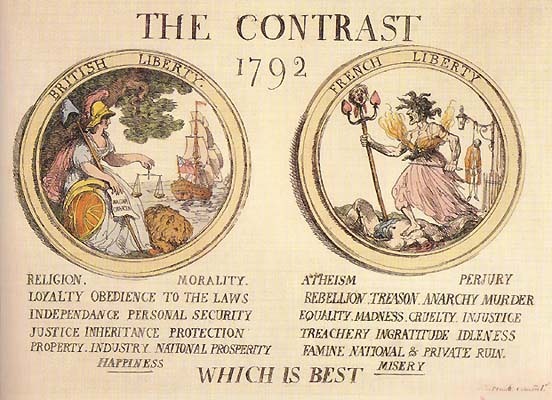 Here’s a great example from Thomas Rowlandson, comparing England and France, entitled, The Contrast 1792. Thomas Rowlandson gives a glimpse at why--although perhaps not quite accurate. 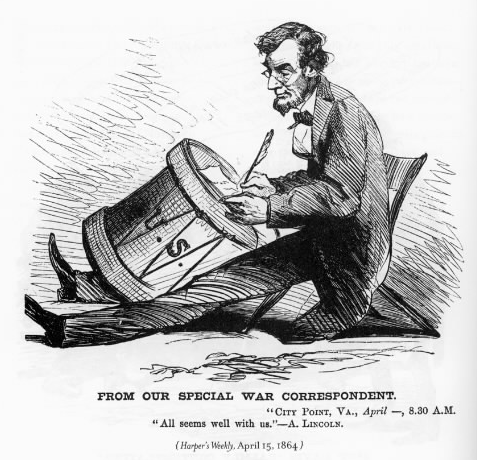 By the late 1700s into the early 1800s, the caricature began to show it's comical face in editorial cartoons. One created in 1805 was regarding William Pitt vs. Napolean. 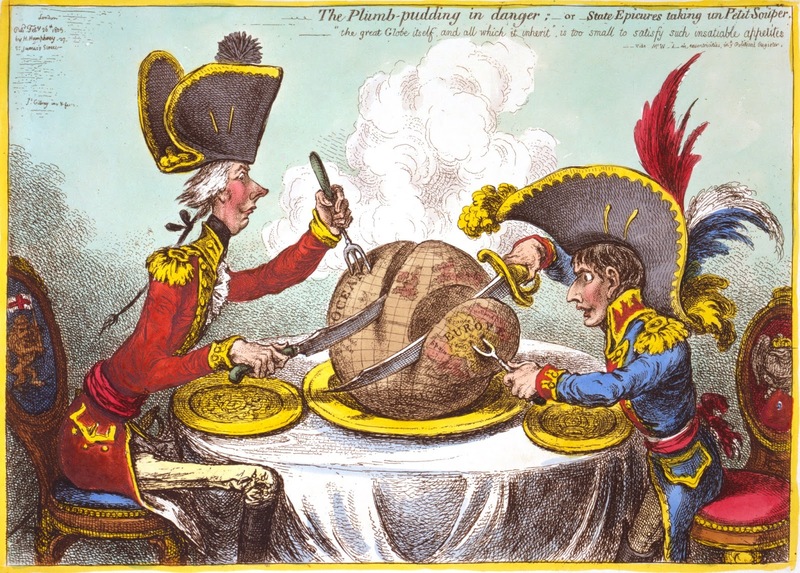 According to Wright & Evans, Historical and Descriptive Account of the Caricatures of James Gillray (1851), "The new Emperor, and his opponent the English Minister, [are] helping themselves—one taking the land, the other the sea. On the overtures made by the new Emperor for a reconciliation with England in the January of 1805." And so now the door was opened to all sorts of political/editorial visuals. Where there are leaders and citizens, things don't always go well. 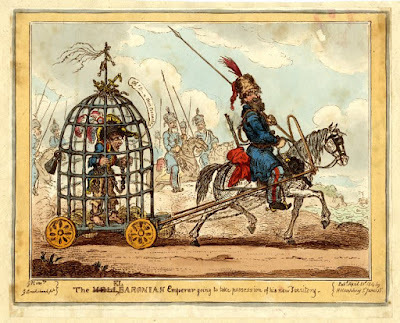 In the case of Napolean, this was well recorded in cartoons in the early 1800s. Then there is the after affects of the war against Russia. Cartoon published by George Cruikshank, 1814. Cossack pulling the cage. 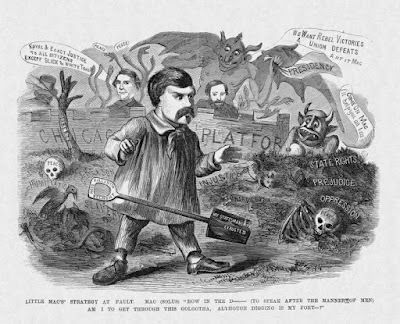 On the American side, the Civil War truly inspired artists, especially Thomas Nast, who is said to be responsible for creating the Elephant for the Republicans, the Donkey for the Democrats and even the endearing drawing of Santa Claus. Many artists told the story, even more vividly than the photographers could back then. Notice the US on drum. Lincoln never recognized the split. Before our Civil War, there were illustrated magazines that were publishing political cartoons. 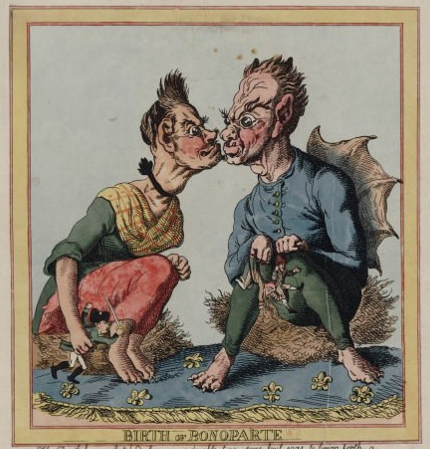 One of the early ones was from Paris, France--an anti-Monarchy publication, entitled, Le Charivari (1832 to 1937). Later came the Punch, London England (1841 to 2002) and in the States, Puck (1871 to 1918). Next month we are going to look at all three magazines to see what they offered to their readers.And then we'll conclude with a look at current day editorial cartoons. 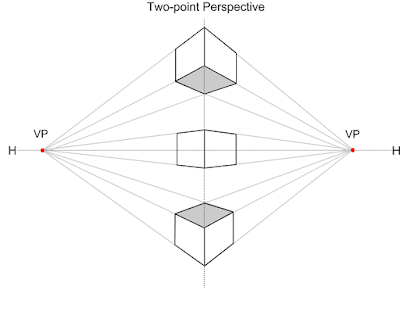 Now that you understand one-point perspective (see last two posts), it should be easier to understand two point. 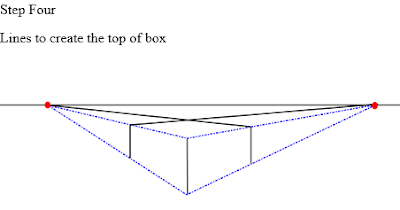 The best way to explain when to use two-point is when you see a corner facing you--a building, a book, a box--you're looking at two planes that have two vanishing points relative to the horizon line. 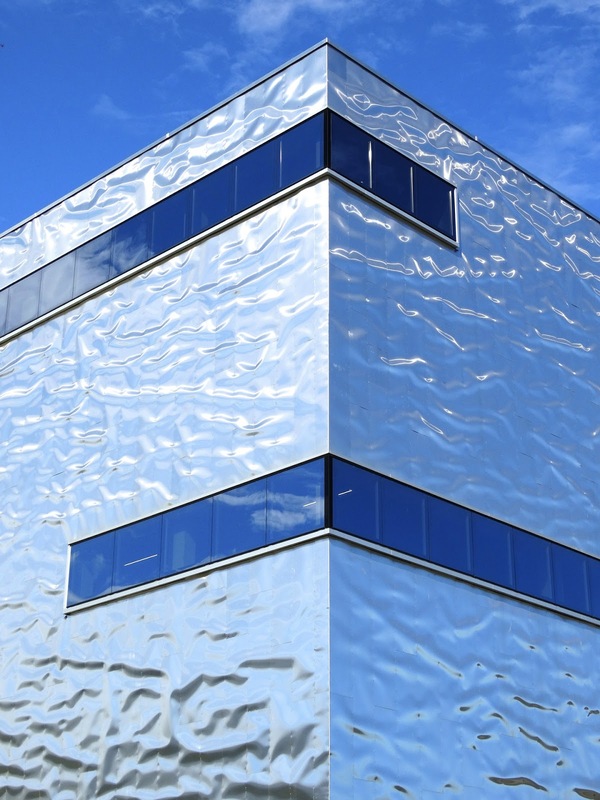 For instance, notice the building below. We are looking at the corner and it is above the horizon line. When constructing such a building on paper, you first determine the horizon line and then the vanishing points. 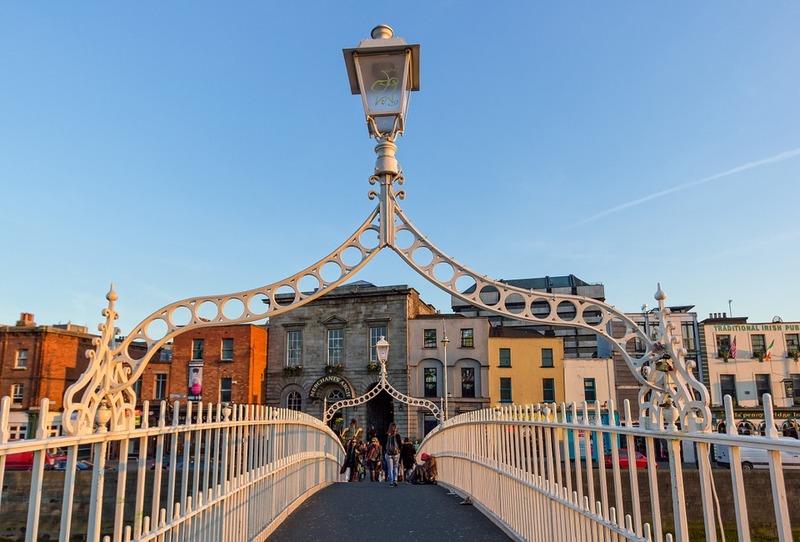 In this example your vanishing points are way outside the photograph. That's usually the case. Next, you draw the corner line and then connect the "dots" with orthogonal (vanishing) lines and vertical lines. In the drawing below you can see how the top block is above the horizon line. But there are others--one on the horizon line and the other below. 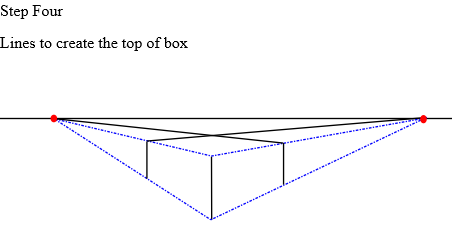 Here's a step-by-step method to creating that last box, which is beneath the horizon line, often called bird's eye view. As I stated, you have to first establish your horizon line and vanishing points. 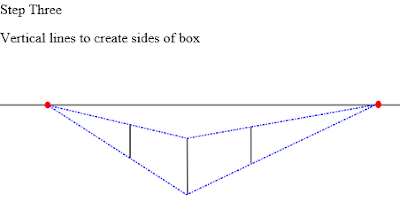 Then you draw your corner line (this should represent the height of your building or box. 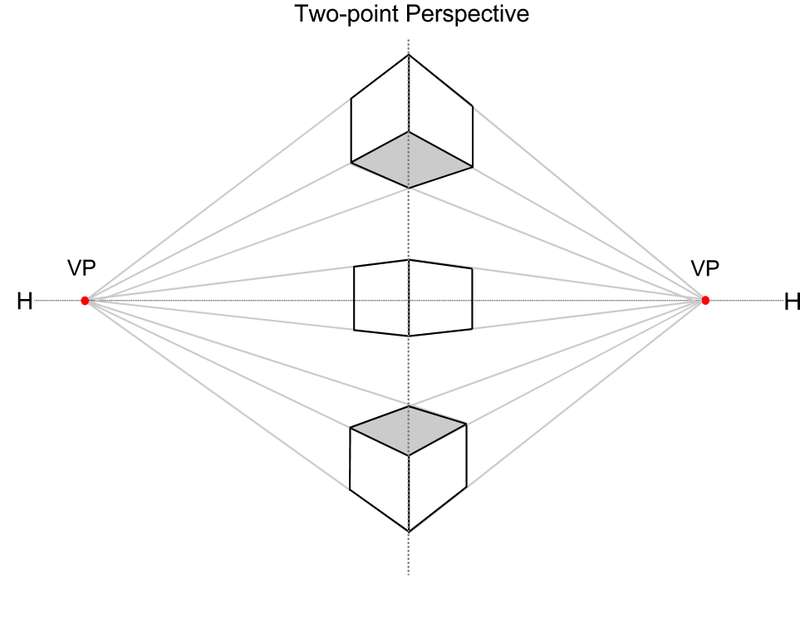 Just as in one-point perspective, you have two planes here--the one on the right and other on the left. 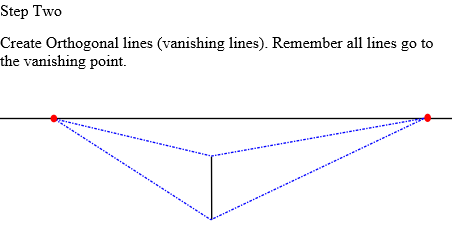 You draw vanishing lines from the top (and bottom) of the corner line to the point as demonstrated by the blue lines in the illustration. You've just created the sides of the building/box. Now that you have the sides done, you need to create the width by placing vertical lines between the vanishing lines. So far, we have two walls up and running. But now we have to create the top. This can be tricky for some. Intuitively, I always wanted to draw the lines parallel to the bottom--but that was wrong. Instead we draw some more vanishing lines. For the right hand side of the box, you draw a line from the left-hand VP. to the right vertical line. 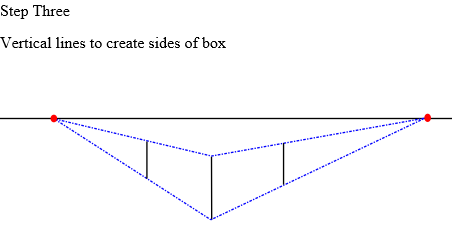 For the left side, you draw a line from the right VP to the left vertical, as shown here. 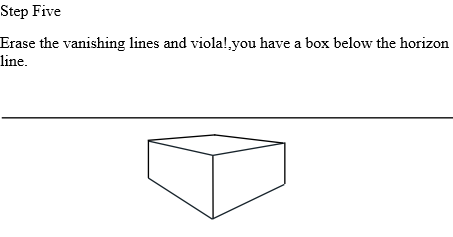 The final step is easy, just erase your lines and you have a box that's just below the horizon line. What's neat about learning how to draw a box or building is your ability to create villages or even cities. During my perspective day-long workshop in March, that's just what we'll do. It is really a lot of fun when you understand the mechanics.